Background Few large prospective studies have investigated the impact of body mass index (BMI) on lung function during childhood. Methods Using data collected between 2002 and 2013, we analysed associations between BMI status and lung function (assessed by spirometry) from 8 to 16 years, as well as cross-sectional associations with small airway function (impulse oscillometry) at 16 years in the BAMSE cohort (n=2889). At 16 years, cross-sectional associations with local and systemic inflammation were investigated by analysing FENO, blood eosinophils and neutrophils. Results Overweight and obesity at 8 years were associated with higher FVC, but lower FEV1/FVC ratio at 8 and 16 years. In boys, but not girls, obesity at 8 years was associated with a further reduction in FEV1/FVC between 8 and 16 years. In cross-sectional analyses, overweight and obesity were associated with higher frequency dependence of resistance (R5–20) and larger area under the reactance curve (AX0.5) at 16 years. Increased blood neutrophil counts were seen in overweight and obese girls, but not in boys. No association was found between BMI status and FENO. Persistent, but not transient, overweight/obesity between 8 and 16 years was associated with higher R5–20 and AX0.5 and lower FEV1/FVC (−2.8% (95% CI −4.1 to −1.2) in girls and −2.7% (95% CI −4.4 to −1.1) in boys) at 16 years, compared with persistent normal weight. Conclusion In childhood and adolescence, overweight and obesity, particularly persistent overweight, were associated with evidence of airway obstruction, including the small airways. Are overweight and obesity associated with reduced lung function, including small airway obstruction in school-age and adolescence? Both overweight and obesity, and particularly persistent overweight, in childhood and adolescence are associated with physiological signs of airway obstruction, which also involves the peripheral airways. This population-based longitudinal study is the first to investigate the association between overweight/obesity and peripheral airway obstruction among adolescents. Obesity is a global health challenge associated with several adverse health consequences.1 The respiratory system may be adversely affected due to low-grade systemic inflammation and increased mechanical load of the truncal fat on the chest resulting from obesity.2 3 Most studies in children have observed an association between high body mass index (BMI) or waist circumference and reduced ratio between FEV1and FVC, but unaffected or higher FEV1 and FVC.4–12 This was also confirmed in a recent meta-analysis which reported a 2.4% (−3.0; −1.8) lower FEV1/FVC in overweight or obese, compared with normal weight children.13 These results indicate that childhood overweight and obesity might be associated with airway obstruction, although lung volume and flow may be high or normal. In another recent analysis including six cohorts of children, Forno et al14 provided new physiological insights by showing that overweight and obesity were associated with dysanapsis (incongruence between growth of the lungs and the airways, characterised by abnormal FEV1/FVC despite normal FEV1 and FVC) in both children with and without asthma. The authors discuss that childhood obesity results in anatomical and/or developmental airflow obstruction that are not related to airway inflammation, although measurements using other methods are required to confirm this hypothesis.14 In addition, the role of local or systemic inflammatory mechanisms needs to be explored further. The majority of studies linking obesity and lung function in children are based on spirometry, which mostly reflects large airway function.15 Impulse oscillometry (IOS) is an effort-independent technique to assess lung resistance and reactance, with potential to discriminate between peripheral and central airway function.16 Small airway function has been associated with asthma symptoms such as dyspnoea, impaired asthma control and health-related quality of life.17 18 However, it is still unknown how overweight and obesity affect the small airways in children and adolescents. Moreover, the temporal relation between obesity and lung function development is unclear, as most evidence linking childhood obesity and lung function is cross-sectional. In the Dutch PIAMA birth cohort, persistent but not transient high BMI between 8 and 12 years was associated with lower FEV1/FVC among 1090 children at 12 years.19 In the present study, we extend these temporal analyses on overweight duration up to 16 years. The main aim of the present study was to investigate the longitudinal association between BMI status between school-age and adolescence in relation to lung function, including small airway function, in a large population-based prospective cohort. To gain insight into potential mechanisms, a secondary aim was to investigate whether overweight and obesity are associated with airway and systemic inflammation biomarkers. The study population includes children from the prospective birth cohort BAMSE, previously described in detail elsewhere.20 21 The BAMSE study includes 4089 children from the northwestern and central parts of Stockholm, Sweden (75% of eligible children in the catchment area). Non-responders and children who were actively excluded from the baseline cohort were similar to the study population in terms of parental allergic disease and pet keeping; however, the proportion of parental smoking was somewhat higher.21 The children were subsequently followed from around 2 months of age, with repeated parental questionnaires on symptoms of allergic disease as well as on lifestyle and environmental exposures. At 16 years, the adolescents themselves also answered a questionnaire. The parental response rate was 84% at 8 years and 78% and 76% for the parent and adolescent, respectively, at 16 years. The IOS measurements have been described elsewhere.23 25 Briefly, external pressure impulses are superimposed during tidal breathing at frequencies between 5 and 35 Hz. Higher frequencies are reaching the large airways, whereas lower frequencies travel deeper into the lung. Participants wore a nose clip and were instructed to tightly seal their lips around the mouthpiece and support their cheeks with their hands. After quality inspection, the mean value of resistance between 5 Hz and 20 Hz (R5–20) and the square root of the area under the reactance curve (AX0.5) were used for analyses (n=2452). Resistance is defined as the ratio of the pressure drop over an airway segment,25 whereas reactance can be viewed as the rebound resistance of the lung.16 Measurements of FENO were performed at an expiratory flow of 50 mL/s (FENO50), using an online chemiluminescent (CLD88) analyser (Eco Medics AG, Duernten, Switzerland) according to ERS/ATS guidelines (n=2087).26 Peripheral blood samples (n=2558) were analysed for eosinophil and neutrophil cell counts at 16 years (Department of Clinical Chemistry, Karolinska University Hospital, Stockholm, Sweden). Asthma symptoms (current wheeze and breathing difficulties during exercise) and medication use were reported by the parent at 8 years and by the adolescent at 16 years. The definitions of these variables are described in the online supplement. The study was approved by the Regional Ethical Review Board in Stockholm. Analyses were stratified by gender, and any potential interaction between BMI status and gender, as well as with wheeze, was tested by the Wald test using an interaction term between overweight and gender and overweight and wheeze, respectively, in the statistical model. 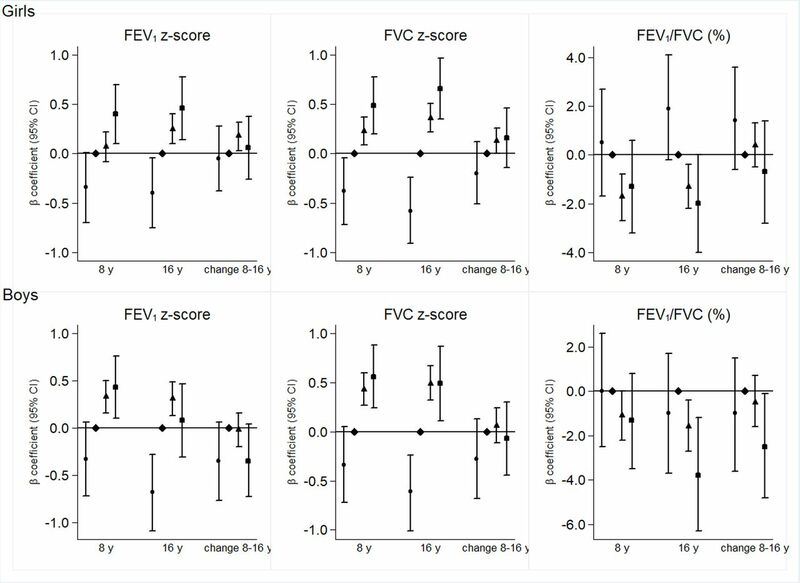 Results were expressed as z-scores using the Global Lung Initiative reference values for FEV1 and FVC28 and as height-adjusted and age-adjusted per cent for FEV1/FVC, to facilitate interpretation. As a sensitivity analysis, FEV1/FVC was also analysed as z-scores to ensure that the results were comparable. IOS results were not transformed to z-scores, due to lack of reference values, but adjusted for height and age. Overweight and obesity were sometimes analysed together due to low numbers in each subgroup. Covariates were identified from previous literature and evaluated as potential confounders in the present study by adding them one by one to the crude model with FEV1/FVC as the outcome for girls and boys separately. The tested variables were parental allergic disease, maternal smoking during pregnancy and/or in infancy, socioeconomic status at baseline, birth weight, gestational age, maternal BMI in early pregnancy, breastfeeding ≥4 months, pubertal status at 12 and 16 years, physical activity at 16 years and self-reported smoking at 16 years. All these variables affected the estimate by less than 10% and were therefore not included in the final model, with the exception of the analyses on FENO which were adjusted for smoking at 16 years. However, an adjusted analysis including key potential confounding factors (socioeconomic status at baseline, maternal smoking during pregnancy and/or in infancy and pubertal status at 16 years) was also performed for completeness. In order to investigate whether asthma or asthma symptoms could explain the association between BMI status and lung function, separate cross-sectional analyses were also performed with adjustment for asthma and wheeze. Definitions of covariates are described in the online supplement. Children were included in the present analyses if spirometry and BMI status were available at 8 or 16 years or if IOS and BMI status were available at 16 years (n=2889); however, the number of children with available data for the different outcomes varied. Children with missing data on one of the exposures, outcomes or covariates were not included in that specific analysis, except for the mixed-effect models analyses which require data on the outcome from at least one time point (see exact number in each table). All analyses were performed using the statistical software STATA V.13 (StataCorp). Only small differences were observed between children who were included in the study population (n=2889) compared with children who did not fulfil the inclusion criteria (n=1199, online supplementary table 1). At 8 years, 17.8% of the girls and 15.2% of the boys were overweight, and another 3.8% and 3.4% were obese (table 1). The prevalence of overweight and obesity declined to 11.7% and 2.0%, respectively, in girls at 16 years, but was rather stable in boys. The majority of children with obesity were moderately obese, and less than 1% fulfilled the definition of obesity class II (which corresponds to BMI 35 kg/m2 at 18 years). At 16 years, 15.9% of the girls and 10.0% of the boys reported wheezing in the past year, and 15.1% of the girls and 18.7% of the boys had had a doctor’s diagnosis of asthma. Figure 1 shows the results from the mixed-effect models analyses of the longitudinal association between BMI status at 8 years and lung function up to 16 years. Both overweight and obesity were associated with higher FVC (eg, SD 0.66 (95% CI 0.35 to 0.97) and SD 0.49 (95% CI 0.11 to 0.87) in obese, compared with normal weight girls and boys, respectively, at 16 years). Overweight was also associated with higher FEV1 in boys at 8 and 16 years and in girls at 16 years, and obesity was associated with higher FEV1 in girls at 8 and 16 years and in boys at 8 years. However, overweight and obesity were associated with lower FEV1/FVC (eg, −2.0% (95% CI −4.0% to 0.0%) and −3.8% (95% CI −6.3% to −1.2%) in obese, compared with normal weight girls and boys, respectively, at 16 years). Thinness was associated with lower FVC and FEV1, but there were no significant associations between thinness and FEV1/FVC. Analysing FEV1/FVC by z-score instead of percentage had no impact on the interpretation of results (results not shown). Additional adjustments for maternal smoking during pregnancy and/or infancy, socioeconomic status at baseline and pubertal status at 16 years did not have any major impact on the observed associations (results not shown). Association between BMI status (thinness (●), normal weight (♦, referent), overweight (▲) and obesity (■)) at 8 years and lung function (FEV1 (z-scores), FVC (z-scores) and FEV1/FVC (%)) up to 16 years. β-Coefficients and 95% CIs were estimated using mixed-effect models (n=1158 girls with 1827 observations and n=1135 boys with 1689 observations). Changes in lung function between 8 and 16 years (‘change 8–16 years’) were estimated by the interaction between BMI status and the time indicator variable. BMI, body mass index. Changes in lung function between 8 and 16 years were analysed in relation to BMI status at 8 years by estimating the interaction between BMI and age. In males, obesity was associated with a further reduction in FEV1/FVC between 8 and 16 years, whereas there was no association between overweight and change in FEV1/FVC. In females, overweight, but not obesity, was associated with a small positive change in FEV1 and FVC between 8 and 16 years, whereas no association was observed between overweight or obesity and change in FEV1/FVC. In addition, we analysed the cross-sectional association between BMI status and dysanapsis at 16 years. Out of 2052 participants with available information on FEV1, FVC and BMI status at 16 years, 180 children (8.8%) fulfilled the definition of dysanapsis. Dysanapsis was more common among overweight/obese children compared with normal weight children (OR 1.61 (95% CI 0.90 to 2.86) in girls and 1.77 (95% CI 1.08 to 2.92) in boys) (thinness excluded, n=1641). BMI status at 8 and 16 years was further analysed in relation to small airway function at 16 years (table 2). Cross-sectional analyses at 16 years showed that overweight and obesity were associated with higher AX0.5 and R5–20 at 16 years (table 2), with stronger associations in overweight girls, compared with boys (P value for interaction=0.03 for R5–20 and 0.004 for AX0.5). Thinness was associated with lower R5–20. Analysing BMI status at 8 years in relation to IOS at 16 years resulted in somewhat weaker associations, compared with BMI at 16 years. Overweight in girls and obesity in boys at 8 years were associated with higher R5–20 and AX0.5 at 16 years. Overweight (including obesity) was significantly associated with asthma symptoms (wheeze and breathing difficulties during exercise), doctor’s diagnosis of asthma and asthma medication in cross-sectional analyses at 16 years among girls (online supplementary table 2), whereas weaker associations were seen for boys. Categorisation of children into groups of overweight (including obesity) and/or wheeze at 16 years (figure 2) showed that overweight and wheeze were both independently associated with lower FEV1/FVC at 16 years (−2.5% (95% CI −3.6% to −1.3%) and −2.6% (95% CI −3.7% to −1.4%), respectively, among girls and −2.0% (95% CI −3.2% to −0.8%) and −3.1% (95% CI −4.6% to −1.5%), respectively, among boys). Concomitant overweight and wheeze were associated with further reduction in FEV1/FVC (−3.8% (95% CI −5.9% to −1.8%) in girls and −3.6% (95% CI −6.3% to −0.94%) in boys), but there was no significant interaction between overweight and wheeze. 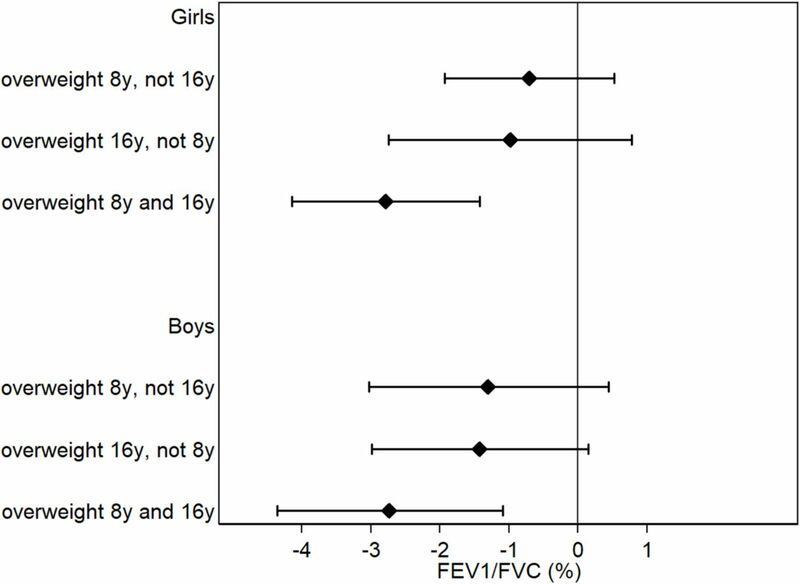 Association between overweight (includes overweight and obesity) and/or wheeze at 16 years and FEV1/FVC (%) at 16 years (n=1015 girls and 840 boys). The point estimate represents mean difference in FEV1/FVC compared with the reference group (children with no overweight and no wheeze) calculated by linear regression adjusted for age and height. Children with thinness are excluded. As BMI and asthma were associated, we aimed to investigate whether asthma or asthma symptoms could explain the association between overweight/obesity and lung function. We therefore performed separate cross-sectional analyses on overweight/obesity and lung function at 16 years, adjusted for wheeze and asthma. Neither asthma nor wheeze was found to have any major impact on the estimates between overweight/obesity and lung function (results not shown). Subsequently, we analysed cross-sectional associations between BMI status and local and systemic inflammatory biomarkers at 16 years. There was no association between BMI status and FENO (online supplementary table 3). Overweight and obesity were associated with higher blood neutrophil cell count in girls (P=0.03 and 0.007, respectively), but the association was weaker and non-significant in boys (online supplementary table 3). Obesity, but not overweight, was associated with somewhat higher blood eosinophil cell count in girls (P<0.001), whereas no association was observed in boys (online supplementary table 3). Figure 3 shows the association between BMI status, analysed longitudinally between 8 and 16 years, and FEV1/FVC at 16 years. Mean (SD) BMI for each group is presented in online supplementary table 4. Persistent, but not transient, overweight (including obesity) between 8 and 16 years was associated with lower FEV1/FVC at 16 years, among girls (−2.8% (95% CI −4.1% to −1.2%)) and boys (−2.7% (95% CI −4.4% to −1.1%)), compared with persistent normal weight. Overweight at 16 years, but not 8 years, was borderline associated with lower FEV1/FVC. Overweight at 16 years, but not 8 years, and persistent overweight were further associated with higher AX0.5 and R5–20 (online supplementary table 5), with significantly stronger associations among girls, compared with boys in the persistent overweight category (P value for interaction <0.05). Transient overweight was not associated with AX0.5 or R5–20 at 16 years. There was no association between change in BMI status between 8 and 16 years and FENO. Persistent overweight between 8 and 16 years was however associated with higher blood neutrophil, but not eosinophil, cell count at 16 years (online supplementary table 5). Associations between overweight (includes overweight and obesity) status between 8 and 16 years and FEV1/FVC at 16 years (n=840 girls and 720 boys). The point estimate represents mean difference in FEV1/FVC compared with the reference group (children with normal weight at 8 and 16 years) calculated by linear regression adjusted for age and height. Children with thinness are excluded. In the present study, we analysed longitudinal and cross-sectional associations between BMI status and lung function from 8 to 16 years among 2889 children from the BAMSE population-based birth cohort. The main analyses showed that overweight and obesity were associated with evidence of airway obstruction (reduced FEV1/FVC), but increased lung volume (FVC) and flow (FEV1) up to 16 years, which is consistent with most previous studies on spirometry in children.4–12 Further, we found that overweight and obesity were associated with indications of peripheral airway obstruction as measured by the IOS technique in cross-sectional analyses, with stronger associations in girls, compared with boys. These results are novel and complement and strengthen our spirometry findings of airway obstruction (low FEV1/FVC ratio). In boys, obesity at 8 years was associated with further reduction in FEV1/FVC between 8 and 16 years, whereas in girls, there was no additional decrease from 8 to 16 years of age. Forno et al14 showed that obesity is associated with airway dysanapsis and suggested that obesity is primarily related to anatomical and developmental airway obstruction that may not be related to airway inflammation or bronchospasm.14 In the present study, we observed similar associations with airway dysanapsis in cross-sectional analyses at 16 years. In line with their hypothesis, we found no association between BMI status and FENO. The results are consistent with previous cross-sectional studies, which have found no or negative associations between BMI and FENO in children.12 29–31 Altogether, these findings suggest that obesity is associated with airway obstruction not driven by eosinophil airway inflammation. 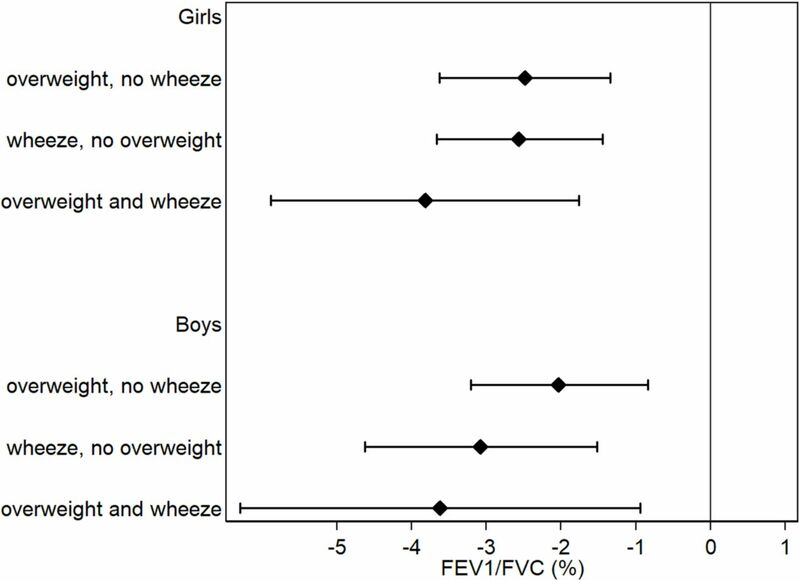 Overweight and wheeze were both independently associated with lower FEV1/FVC in cross-sectional analyses at 16 years. Concomitant overweight and wheeze were associated with further reduction in FEV1/FVC, but there was no significant interaction between overweight and wheeze, indicating that the association between overweight and FEV1/FVC does not differ by wheeze status. Also, adjusting for asthma or wheeze did not affect the observed cross-sectional associations between BMI status and lung function at 16 years, indicating that the results are not explained by asthma or asthma symptoms. Overweight and obesity were, however, associated with higher blood neutrophil cell count in cross-sectional analyses at 16 years, especially in girls. Obese asthma in children has previously been shown to mainly be non-eosinophilic in females but not in males.31 In adults, obesity has been associated with blood and sputum neutrophils in asthmatic women, but not men.32 33 No significant association was observed for eosinophils in these studies. Altogether, these results suggest that overweight and obesity in females are primarily associated with a neutrophilic, rather than eosinophilic, systemic inflammation, whereas findings are less clear for males. However, it should be noted that levels of both eosinophils and neutrophils were increased in obese girls in our study, indicating a general systemic inflammatory effect in these subjects. The higher R5–20 and AX0.5 among overweight and obese individuals may be explained by compressed basal lung regions due to the increased abdominal volume.34 A compressed lung decreases compliance in the overall respiratory system, including the small airways. The larger lung volume among overweight and obese individuals would theoretically lead to lower resistance and greater compliance; however, this might not be the case as tidal breathing mainly involves the basal, more compressed, parts of the lung.35 For the same reason, FEV1/FVC might be lower among overweight and obese individuals as the expired air is coming from the compressed basal regions of the lung at the end of the forced expiration. The physiological impacts of obesity on lung function seem to be reversible, however, as bariatric surgery-induced weight loss has been shown to improve small airway function and FEV1/FVC in obese adult patients.36 Our longitudinal analyses on change in BMI status between 8 and 16 years showed that persistent, but not transient, overweight between 8 and 16 years was associated with airway obstruction at 16 years. These results build on to the Dutch PIAMA study which showed that persistent, but not transient, high BMI between 8 and 12 years was associated with reduced FEV1/FVC.19 From a public health perspective, these findings are important as they, again, indicate that obesity-related lung function reductions are reversible and highlight the importance of managing overweight and obesity as early as possible. The strengths of the present study include the large population-based cohort with a high response rate, the repeated measurements of BMI status and spirometry and the assessment of lung function using both spirometry and IOS. This enabled us to perform longitudinal analyses, both analysing changes in BMI status and changes in lung function over time. Some potential limitations warrant mention. The majority of existing papers, including our present study, lack assessment of body composition but rather rely on BMI to define overweight and obesity. Although BMI, according to WHO, provides the most useful population-level measure of obesity,37 it cannot differentiate between lean and adipose tissue. During adolescence, increased BMI could to some extent reflect pubertal status and gain in lean mass, rather than fat mass. Pubertal status is also related to lung development.38 In our study, pubertal status was therefore evaluated as a potential confounder, but was not found to affect the results. Analysing body composition might yet provide more information about the obesity–lung function association, and local fat deposits such as visceral fat might, at least partly, drive the association between obesity and asthma.30 The adipose tissue secretes several different proinflammatory cytokines, which may explain this association; however, in the present study, we did not have information on these cytokines. With a rising prevalence of obesity among children and adolescents, our results might have important clinical implications as childhood lung function is an essential determinant for adult lung function.41 Therefore, identifying modifiable risk factors, such as overweight and obesity, is important for prevention of impaired lung function and potentially, subsequent respiratory disease. In childhood and adolescence, both overweight and obesity, and particularly persistent overweight, were associated with evidence of airway obstruction, including the small airways. Female overweight and obesity were further associated with increased circulating neutrophils. However, lung volumes and flows were in general higher in overweight compared with normal weight children, and the long-term impact of childhood obesity on respiratory health needs to be explored further. We thank all the participants in the BAMSE study as well as all the staff involved, especially Eva Hallner and Sara Nilsson. Statistician Niklas Andersson is also acknowledged for statistical support. World Health Organization. Obesity: preventing and managing the global epidemic: report of a WHO consultation. (WHO technichal report series 894). Geneva, Switzerland: World Health Organization, 2000:1–253.
. Quantile regression. New York, NY: Cambridge University Press, 2005. World Health Organization. Obesity and overweight: fact sheet N0 311 [Internet: World Health Organization, 2012. http://www.who.int/mediacentre/factsheets/fs311/en/index.html (cited 30 Jun 2017). The Public Health Agency of Sweden. Övervikt och fetma – nationella resultat och tidsserier 2016. The Public Health Agency of Sweden 2016. https://www.folkhalsomyndigheten.se/folkhalsorapportering-statistik/statistikdatabaser-och-visualisering/nationella-folkhalsoenkaten/levnadsvanor/overvikt-och-fetma/ (cited 2017 June 30).
. Prevalence of Obesity Among Adults and Youth: United States, 2011-2014. NCHS Data Brief 2015;219:1–8. AB and EM contributed equally. Contributors EM, AB and IK are principal investigators of the BAMSE cohort. SE, AB and EM designed the study. SE, JH, IK, JLPP, PT, PMG, AB and EM planned the analyses and interpreted the results. SE performed the statistical analyses and prepared the first manuscript draf. MB provided statistical expertise for the analyses. SE, JH, IK, JLPP, PT, MB, PMG, AB and EM critically revised the manuscript. All authors approved the final version of the manuscript. Funding This work was supported by the Swedish Research Council (VR), the Stockholm County Council (ALF), the Swedish Heart and Lung Foundation, the Swedish Research Council for Health, Working Life and Welfare, the Swedish Asthma and Allergy Foundation, the European Commission’s Seventh Framework 29 Program MeDALL under grant agreement no 261357, the Freemason Child House Foundation in Stockholm and the Swedish Research Council Formas. Ethics approval Regional Ethical Review Board in Stockholm.